17a. [The ailing postal worker was …] OUT OF SORTS. 24a. [The ailing rock star was …], FEELING PUNK. Yes!! This was the phrase my grandma always used when she had some bug. Never heard anyone else say it. 38a. [The ailing meteorologist was …], UNDER THE WEATHER. 47a. [The ailing golfer was …] WAY BELOW PAR. Never heard anyone use that for feeling sick, just for not meeting expectations. 59a. [The ailing trash collector was …] IN THE DUMPS. That one’s for emotional ailments. So is 17a. 50d. [George who signed the Declaration of Independence], WYTHE. Is it safe to say that we didn’t all learn his name in school? Tough fill for a Tuesday. 58a. [British gun], STEN. 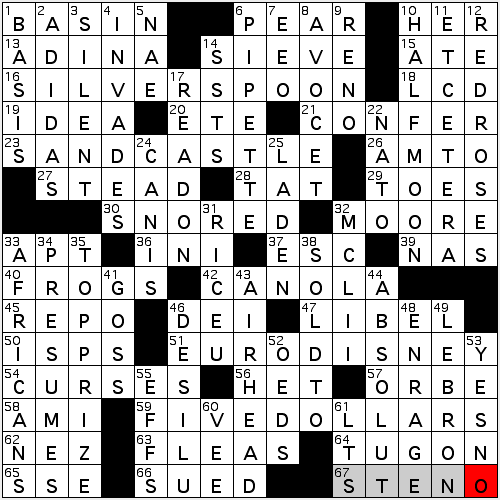 I wager that a sizable majority of people who have not been doing a lot of crosswords don’t know this word. 60d, 61d. [With 61-Down, what “dis” is? ], NOT / DAT. What a weird little x-ref. 10d. [Where umpires umpire], HOME PLATES. This plural made my husband laugh. 35d. [Typical western], SHOOT ‘-EM-UP. Lively (if violent) answer. 12d. [Half of humanity, to some feminists], WOMYN. I’m not 100% sure on this, but I feel like there ought to be a temporal angle in the clue, a reference to the ’70s and ’80s. 10a. [Turns left, as a plow horse], HAWS. Almost put in GEES, which is your farm animal turning right. This puzzle might be coming to us from the 1800s, before the advent of the crossword. Got distracted watching Better Call Saul during the blogging. 4.75 stars for the TV show, 3.33 for the puzzle. The unevenly wrought theme and some Tuesday-unfriendly fill knocked it down some. 23A. [Beach house?] SAND CASTLE and sand dollar. But for the fact that this is the sole themer that doesn’t yield or refer to actual $$, I love everything about this one. Great clue for image-evoking fill and a most poetic/symbolic kind of (yep, it’s here again) aquatic specimen. 51A. [Company that runs a Mickey Mouse operation] EURO DISNEY and euro dollar. Love that literal, non-ironic clue. Any snark is of your own (eurown…) making! 10D. [Henry Hudson’s ship] HALF MOON and half dollar. Colorful fill and colorful history here as well. 35D. [Gold medal or blue ribbon] TOP PRIZE and top dollar. And sometimes the top prize pays top dollar (okay, maybe not at the Sudoku or Scrabble level, but still, the not-too-shabby…ACPT)! 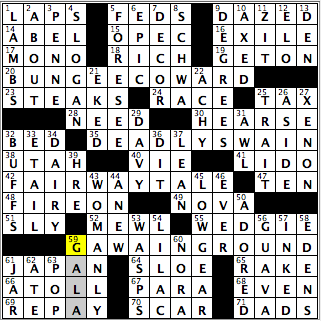 A lotta strong fill and thoughtful (knowledge-base expanding or twisty) cluing throughout the grid—which always ups the ante of a puzzle’s challenge. And this one challenged me. Drew several blanks right from the get-go: alternative rock singer-songwriter Rob Thomas and “HER Diamonds”? Nupe. Russian-born diva Anna Netrebko and ADINA? Nyet to the former [I know: “Philistine!”]; da to the latter. ZX Flux shoes, NAE; ADIDAS, aye. SILENT [Mum] was a big help in the NW corner; and I was relieved that HALF MOON, ET CETERA and RED ROSES (2/14: Valentine’s Day…) easily went into the NE. The corresponding corner was a little tougher, but yielded the other triple eights: AFRICANS (from the not-so-easy-to-parse [Chad chaps]), PRESUMES and TOP PRIZE. There’s nothing particularly sly about the [Italian diminutive ending] -INI combo, but it’s definitely a happy-making one, conjuring up Breaking Away as it does, and Paul Dooley’s “eenie”-food diatribe. And I also like the pair of canine clues: [Dog days of Dijon] and [Dog in astronomy], for ÉTÉ and CANIS respectively. 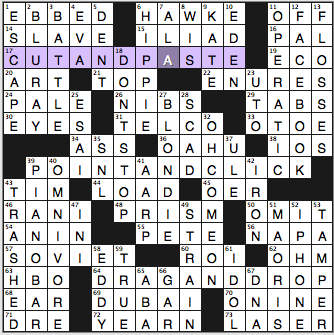 As you well know if you’ve been reading this column for any time, I loves me my crossword glue—and also picture-making language, like [Flour de-clumper] for SIEVE and [Lily pad travelers] for FROGS. This puzzle is LADEN with lovely language, and that always floats my boat! Til we meet again: Happy Valingtine’s [sic]! Good morning, everyone! How’s everything?! If you’re in the New England area, I hope you’re braving the elements once again and making it out OK with another snowstorm in the area. If you’re in the state of Washington, I hope it’s dry and not raining. Washington, or at least its postal code, is the subject of today’s crossword, offered up to us by Mr. Patrick Jordan. In it, common phrases are altered by adding “WA” into each of them, creating puns. BUNGEE COWARD (20A: [One who’s scared to try a popular jumping sport?]) – From “bungee cord.” I’m definitely a bungee coward then! Also, is bungee jumping popular still? About 10-15 years ago, it was, but not sure it is now. Maybe I’m hanging with the wrong, non thrill-seeking crowd. FAIRWAY TALE (42A: [“I drove that golf ball 500 yards,” for example?]) – From “fairy tale.” Anyone ever wonder if those long-drive experts who mash the ball in upwards to 500 yards for a living can actually play real rounds of golf with skill? The last time I was at my parents’ place, my mother could not stop watching the DECOR and other things featured on many of the HGTV shows that were on (7D: [Frequent topic on HGTV]). I think her favorite show is House Hunters International, but I’ll have to confirm that with her. In a case of overthinking, I momentarily was tripped up by HEARSE, as I thought that the car actually had a name on the show, even though I knew it was a type of hearse (30A: [“The Addams Family” car]). Was slightly confused by WEDGIE, as I thought those shoes were called wedges, and I initially filled that in (55A: [Thick-heeled shoe]). That, and I also thought about the childhood underpants prank when I saw that as well. If you’re hungry right now, that’s probably because of the intersection of LAMBS (1D: [Youngsters in petting zoos]) and STEAKS (23A: [Some Texas Roadhouse entrées]). As much as steaks sound like a dream right now, not sure how to feel about GUAVA-flavored jelly (56A: [Exotic jelly flavor]). Anyone who has tried that who can give me a verdict? “Sports will make you smarter” moment of the day: ABEL (14A: [Biblical second son]) – Former National Hockey League player Sid ABEL spent most of his career with the Detroit Red Wings during his Hall-of-Fame, 14-year NHL career. In the late 1940s, he was one-third of the “Production Line,” one of the most famous line combinations in NHL history, along with Gordie Howe and Ted Lindsay. Abel , a member of three Stanley Cup-winning teams, won the Hart Memorial Trophy as the NHL’s Most Valuable Player in 1949. See you on Wednesday, and have a good rest of your Tuesday! The LINT in three familiar phrases has been sucked down into the LINT trap in the bottom row. 16a. [Swindling of a UK football club? ], CHELSEA CON. Chelsea Clinton. Hey, someone should send this puzzle to her dad. 37a. [Grade alongside the review “These Mick Jagger chewables are the worst”? ], F / STONES’ VITAMINS. Flintstones vitamins. 61a. [Group including only elements number #13 and #2? ], AL-HE FAMILY. All in the Family. 66a, 67a, 68a. [Stuff in the trap], LINT, LINT, LINT. So, I’ve been using Tide powdered laundry detergent, Original scent, for a few years. Those bastards changed the scent. (Do they have no idea what “Original” means? Come on! “Original” is sacrosanct!) The new heavily perfumed product leaves the clean clothes smelling like a fresh ‘n’ clean bordello, and and gives me a damn rash. So I’ve been doing a lot of laundry to rewash my clothes in a fragrance-free detergent. The lint trap and I have grown very close. Because it’s late, I’m putting everything else in this paragraph. Like TYLENOL and MR. CUB. Love DEATH WISH. Didn’t know TERM LOAN was a thing. Don’t care for plural AKAS, or for OHH, FBS, WCW, SST. Lotsa names from pop culture, which works for me but is not a universal like (I mean, I never even watched Perfect Strangers, but it still amuses me to see the name BALKI here, and it’s a useless little piece of pop culture but I know it). 3.9 stars from me. Whoops, forgot to blog this on Tuesday! Now it’s Wednesday. Theme is [Computer user’s combination], and the three answers are CUT AND PASTE, POINT AND CLICK, and DRAG AND DROP. After I filled in the middle one, I pretty much knew what the other two would be. Quick solve. The 6- to 8-letter Down fill is terrific (particularly OH COME ON, PIANO BAR, FACEBOOK, BLONDIE), but of course stacks of longer fill often come with some ugly short fill. Things that might be tougher for newer solvers include UTO crossing OTOE, IOS as the island (vs. the IPHONE‘s operating system), OHM, RANI, and ESAI. In the underwhelming-fill category, we also have AN IN, -INI, -ULE, TELCO, and O-NINE. Given the lightness of the theme (just 35 squares), I’m surprised there’s that much in my “no” list. But that central 13 forces the corner stacks of longer fill, and the rest follows. This entry was posted in Daily Puzzles and tagged Elizabeth C. Gorski, Jan-Michele Gianette, Kevin Christian, Kurt Mengel, Matt Jones, Patrick Jordan. Bookmark the permalink. 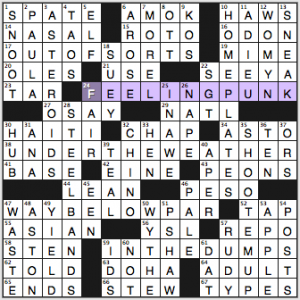 My grandmother and mother used to use “feeling punk” to describe a minor ailment, too. Same comment on WAY UNDER PAR, as that doesn’t denote sickness to my knowledge. Is FEELING PUNK a more regional / Midwestern term? Completely new to me in any context. I like it. Thanks to the crossing, as if I had to guess a letter for the P, it would have been an F for FUNK (and resulting failure ;) ). I think you would lose you bet on sten gun. 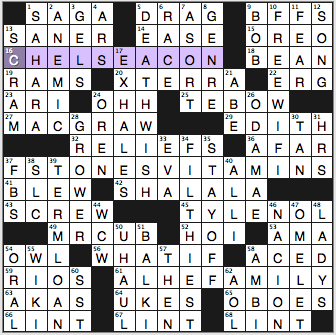 I am just a average crossword hacker and I have seen it many, many times. Amy — and, perhaps, others — I think you’re limiting the meaning of “ailing” too much. It can mean other thnigs besides being sick. It can mean unsound, troubled, confused, annoyed and more. Speak for yourself. I know sten (and bren, and sturmgewehr, and many others – waiting for someone to seize the opportunity to clue AUG as [Steyr __]) from playing too many violent computer games. Hi, Amy, did Better Call Saul interfere with the post of the LAT? I am waiting patiently! Whoops! Totally forgot. Remembered Jonesin’ after 10 pm but spaced on the LAT! I am not crazy about three-puzzles-to-blog days. Thanks, Amy! Better late than never! Thanks for posting, I was hoping you’d get a chance!